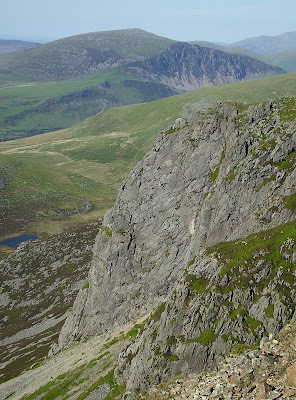 GrahamC and AndyG were out in Wales on Saturday enjoying the sunshine and the exceptional dry conditions. 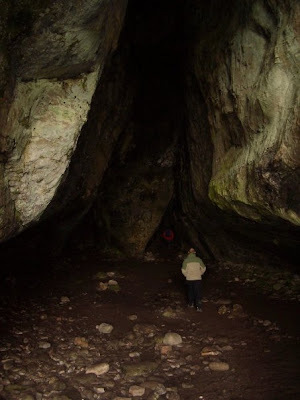 After a long drive and an approach down some uniquely Welsh rural roads, they arrived at the base of the crag at around ten thirty to find that one party had arrived before them. Since their main objective for the day was already occupied, they opted to try Outside Edge Route 136m VDiff. 3*. This climbs the slab to Sunset Ledge and then finishes directly above the nose of the crag in a fine and quite exposed position. 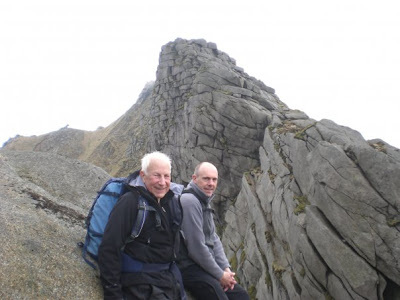 An excellent climb first ascended by John Menlove Edwards in July 1931. Whilst on the route they saw more and more people walking up to the bottom of the crag, some not arriving until well after mid-day. They couldn't help wondering whether these people really managed to get enough climbing done to justify carrying all their gear to the crag in the hot sunshine and perhaps they might have had a more enjoyable time just going for a pleasant stroll around the lakes or along the Nantlle Ridge. Returning to the foot of the cliff Graham and Andy were surprised to find that, despite the crowds of people now milling around, their other objective for the day was now free. After a brief pause for refreshment, they set off up Kirkus's Route 97m VS 4c 3*. This proved to be quite thought provoking. 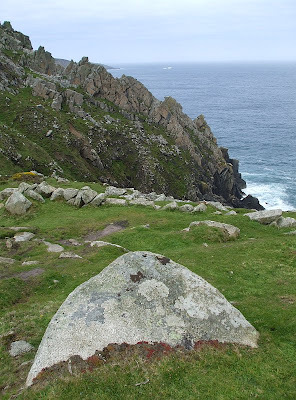 The rock was generally compact so protection was sparse and when available, it did not inspire confidence due to the blocks and flakes appearing loose and detached. However, the climbing is superb. The route, first climbed by Colin Kirkus on 31st of May 1931, takes a nearly direct line up the un-remitting and surprisingly steep slab. 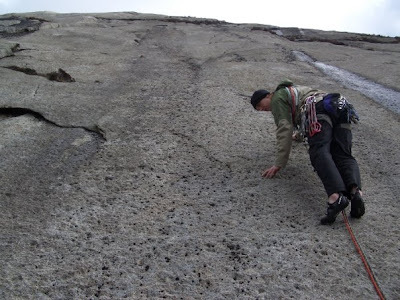 The holds are often hidden and reward a bold approach by appearing magically in some of the blanker looking sections of rock. 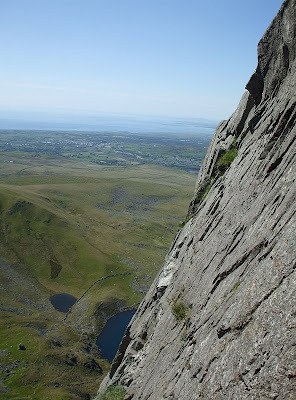 The crag itself is superbly positioned in Cwm Silyn and provides wonderful views of Anglesey and the Welsh coast from Caernarfon westwards towards the Lleyn Peninsula. 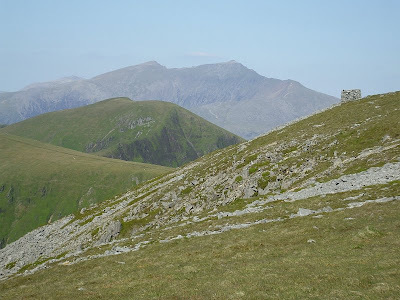 On a clear day, it is well worth finishing with a stroll over the summit to admire the view, especially eastwards where Snowdon and much of the Glyders can be seen very clearly. 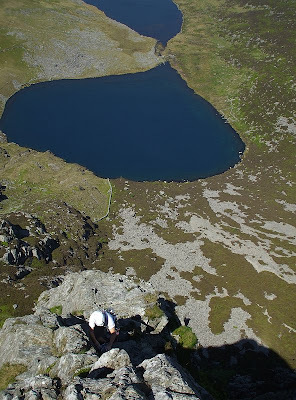 Afterwards, a gentle descent of the ridge above Clogwyn y Cysgod leads easily back to the car. 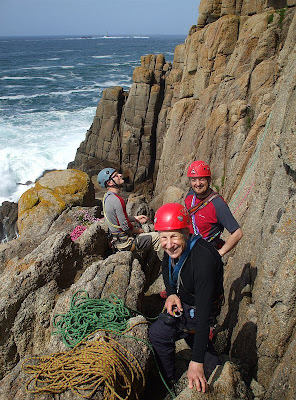 Andy C, Graham, Jeff and Richard made the best of the weather over the bank holiday with a star-studded weekend of climbing in the North-West. Graham and Andy stayed in sunny Lancashire on Saturday, where Andy led some of the finest VS's in the region - Metamorphosis (VS 4c, 3*) and Samarkand (VS 4c, 3*) at Anglezarke, and Mohammed the Mad Monk of Moorside Home for Mental Misfits (VS 4c 3*) at Denham. 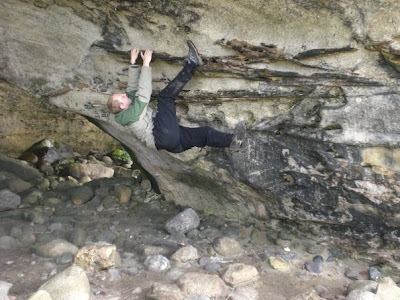 Graham backed off Terror Cotta (HVS 5a, 3*) before leading Wedge (HS 4b, 1*) at Anglezarke. 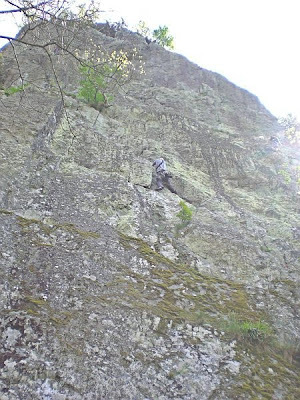 He then made up for his previous failings with a lead of Mohammed the Medieval Melancholic (HVS 5a, 2*) at Denham (a route he failed on a couple of weeks back). 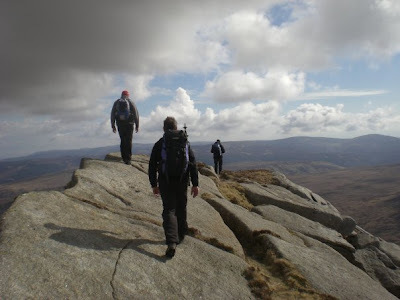 On Saturday evening they travelled up to the club hut, where they were joined by Jeff B, Richard, and some light rain. As is mandatory, a few beers were consumed in the Coledale. Sunday morning started with top class cumberland sausage butties from Braithwaite General Store, before heading up Honister Pass to inspect Buckbarrow How. It was still in the shade, the wind was blowing down the pass, and the crag looked mostly very loose. 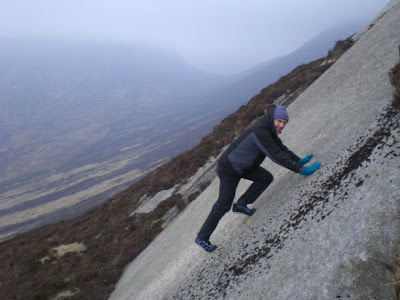 And with not many easy options the consensus was to move on to somewhere a bit more friendly (although Jeff and Graham certainly plan to return sometime to tick the classic of the crag, Sinister Grooves). 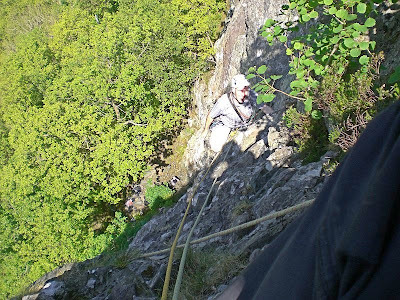 Plan B was Quayfoot Buttress, but this looked damp and uninspiring, so it was decided to head to the ever reliable (and by this time sun-drenched) Shepherds Crag so that something would at least get climbed. 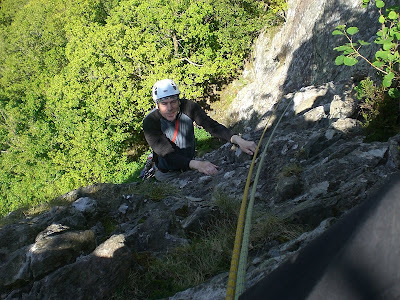 Andy C and Graham switched leads on Eve (VS 4c, 3*) and Brown Crag Wall (VS 4c, 2*) before Andy led Adam (VS 5a, 3*). 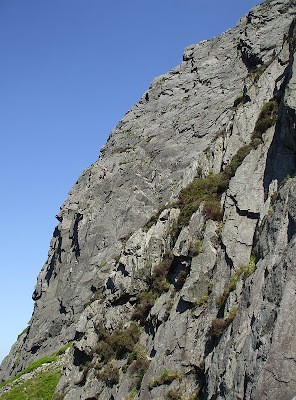 Jeff and Richard also climbed Adam and Brown Crag Wall, either side of soloing of Little Chamonix (VDiff, 3*). 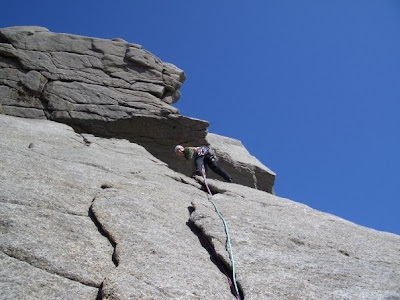 Monday brought more clear blue skies and more quality routes, this time at Castle Rock. Andy led Richard up Gangway Climb (VDiff, 2*) and Kleine Rinne (VS 4b, 2*), while Richard returned the favour on Direct Route (VS 4b, 2*). Jeff and Graham switched leads on Yew Tree Climb (VDiff) before Jeff led Direct Route. 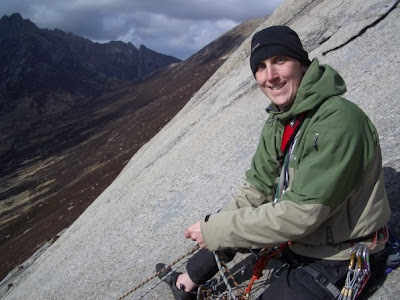 Graham retired after lunch, opting to sunbathe while Andy, Rich and Jeff switched leads on Zig Zag (VS 4b, 2*). Although all four had a very satisfying weekend, it was Andy C that won the Star-Tart Trophy with a total of 28 stars over the course of the weekend. Jonah, RichC, MarkC, MalcolmB and AndyG were in Cornwall earlier this month. They stayed at the excellently appointed and well sheltered Trevaylor Camping Park in Botallack, near St. Just. 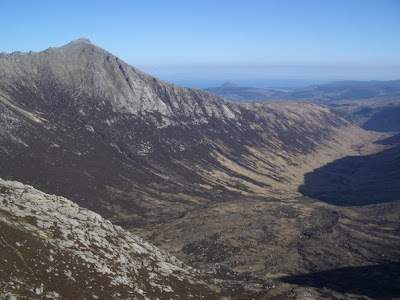 Having travelled separately, AndyG to arrived early enough to pitch his tent and go to Bosigran in the morning for some scrambling and easy solo climbing before the weather turned. Halldrine Cove with Gurnard's Head in the distance. The others arriving later and managed a quick route or two at Sennen before retreating to The Beach at Sennen Cove for coffee. There they were joined by Andy who had already enjoyed a most wonderful cream tea at Rosemergy Farm, near Bosigran. Later after pitching the rest of their tents at Trevaylor, everyone went for a preprandial stroll out to Gurnard's Head. This promontory is home to a route that some of the party have climbed before(more than once), the stunning and very committing Right Angle 75m HS 3*. 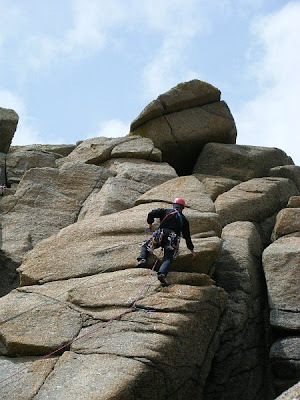 This is an outstanding and unusually audacious climb for it's grade and is highly recommended to competent parties. 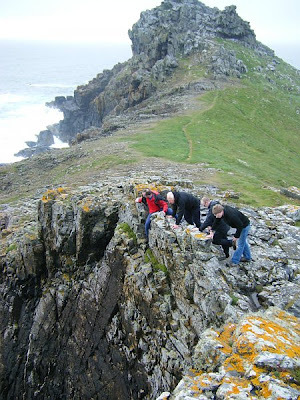 The team inspecting the final pitch of Right Angle at Gurnard's Head. at the Gurnard's Head Hotel. The day was bright and clear, and such a contrast to Friday afternoon. 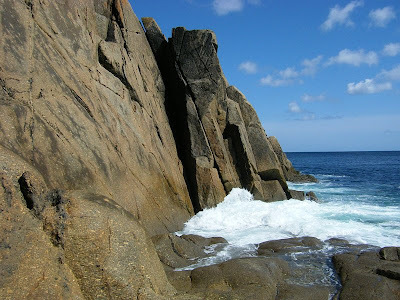 After breakfasting on pasties from the campsite shop(and stocking up with more pasties for lunch) the team went to Porthgwarra which is the usual starting point for visiting the cliffs of Chair Ladder. Knowing that the tide would not be low enough before mid-afternooon, it was decided to visit Pordenack Point in the hope of finding some easier and more accessible non-tidal routes. The south coast looking towards Land's End. 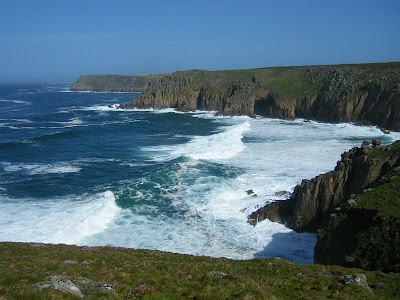 The walk along the coastal path from Porthgwarra towards Land's End is very impressive and was doubly so on this occasion due to a combination of the high tide and a big swell that was crashing waves into the cliffs and sending spray high into the air. 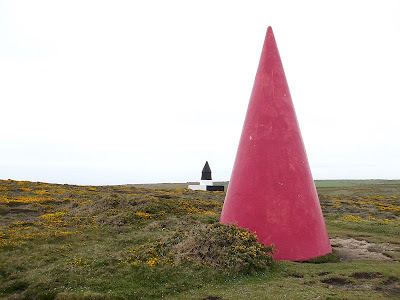 After several false starts, Pordenack Point was eventually located sucessfully. 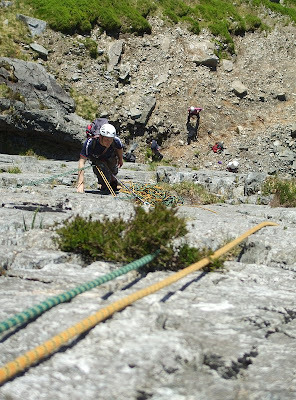 The descent is interesting and involves negotiating "The Squeeze" in order to arrive at "The Trough" from which the routes can be accessed. 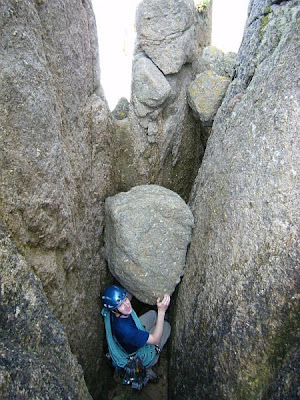 RichC approaching The Squeeze on the descent of Pordenack Point. Jonah, MarkC and MalcolmB in The Trench at Pordenack Point. 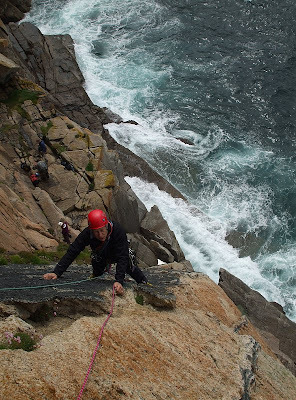 Having despatched the top three pitches of Economist's Climb VDiff., the crew then returned along the coast path in the expectation that the tide would now allow easier access. 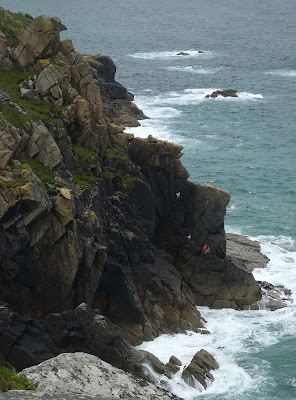 Some returned to Porthgwarra for a sneaky cream tea before walking back up to Chair Ladder where RichC and MarkC did the top two pitches of The Mitre VS 2* while Jonah took AndyG and MalcolmB exploring down Ash Can Gulley. A lifeboat sailing past Chair Ladder. RichC and MarkC then tried Terrier's Tooth HS 3* wich was most enjoyable despite the traditional start still being lapped by the waves. giving warning of the submerged reef and wrecks around The Runnelstone. MalcolmB and AndyG returned early and booked a table for dinner. Being gentlemen they also thought it best to bathe and dress for dinner. The rest of the team returned just in time and soon everyone was enjoying the hospitality of The Queens Arms. It is just across the road from the campsite and serves excellent meals and good local beer. 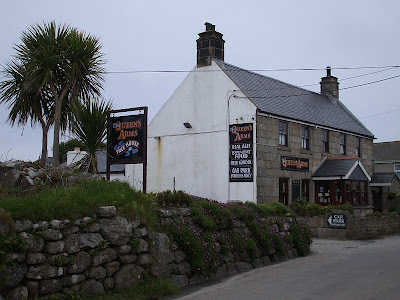 The Queens Arms at Botallack. The good weather continued but the campsite shop was running out of pasties for breakfast, so everyone set off for Sennen Cove in search of a good café. All the places close to the beach either weren't open or didn't do breakfasts. Eventually the White Sands proved to be the most hospitable, supplying nice bacon sarnies and good coffee. After much debate over breakfast a decision was made to go and explore somewhere new. 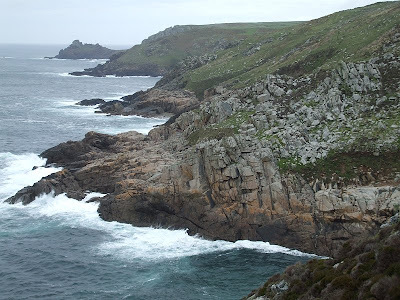 By walking west from Lamorna, past the Tater-du Lighthouse, you come to some overgrown fields. Carefully following the guidebook, it is just possible by wading through the nettles, to find Tregiffian Cove. The main slab at Tregiffian Cove. and MalcolmB and AndyG on Exit VDiff. (Right). Climbs worthy of note include Gravity Slab 15m VS 4c led by RichC and Loose Limpet Crack 27m HS 4b 1* led by both MarkC and Jonah. Also of interest is Down Under 20m HS 4b which looks pretty thin and severely tested MarkC but on closer inspection yields surprising holds. A late finish resulted in a drive to Penzance in search of food where a reasonably priced Chinese buffet was found and which was swiftly demolished. The last day of the trip and the campsite shop was unable to re-stock with pasties because of the Bank Holiday so, after striking camp, it was off to St. Just for breakfast in a café. Then a short drive along the road through Pendeen and Morvah to the ruins of the Carn Galver Mine where there is a parking area for access to Bosigran. 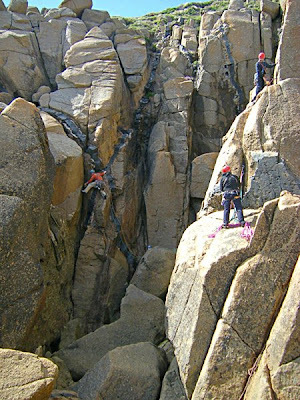 Climbers starting up Commando Ridge. AndyG led MalcolmB up Alison Rib 49m Diff. 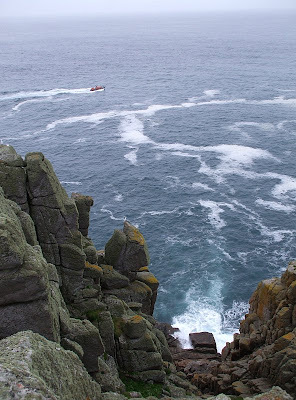 which was quite enjoyable, then they followed the ledges beneath the main face, out to the seaward end of the cliff. 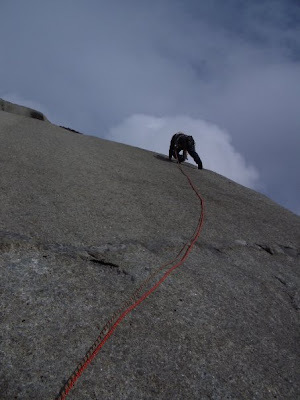 There they ascended the classic Colin Kirkus route Black Slab 33m Diff. 2*. This is a brilliant climb in a great position on the cliff. 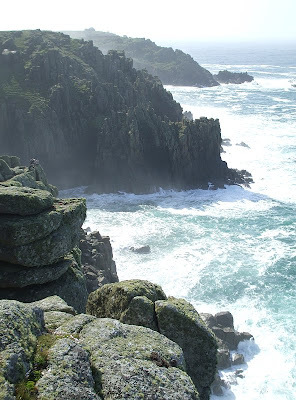 When you are on it, the Black Slab seems to hang in space with nothing but the ocean waves crashing on the rocks below. A great route by a great climber, if you haven't heard of Colin Kirkus before try reading his inspiring book "Let's Go Climbing!". All too soon it was time to pack up and go home. However, those who had prudently moderated their climbing ambitions for the day, still had time for another wonderful cream tea at Rosemergy Farm. Conveniently situated just along the road, within easy walking from the parking area for Bosigran, it is a great place to take a break from climbing or stop for refreshment before journeying onwards. They have a small dining room and a pleasant sheltered garden where they serve nice freshly baked scones with generous helpings of clotted cream and jam, together with proper tea. Always one of the culinary highlights of our trips to Cornwall. 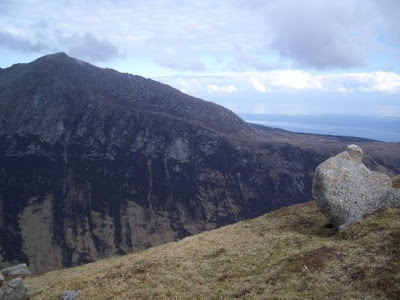 A selection of photos by JeffB and GrahamC from the recent trip to Arran. Also featuring JohnR and "Mad" MalcolmB.